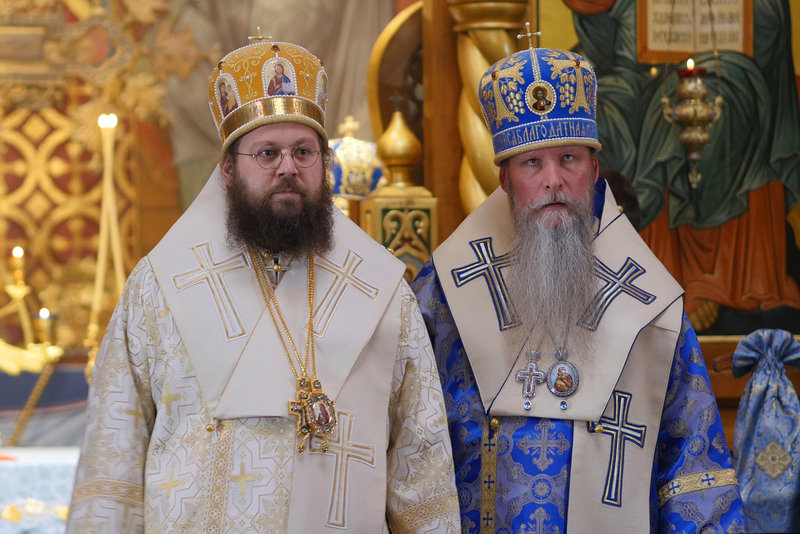 On Sunday November 6, 2016, the day of the Patronal Feast of Holy Virgin Cathedral in San Francisco, the Icon of the Mother of God “Joy of All Who Sorrow,” His Grace Irenei (Steenberg) was consecrated Bishop of Sacramento. 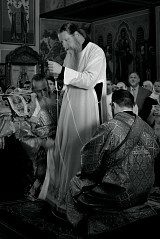 His Eminence Kyrill Archbishop of San Francisco and Western America presided over the celebration. 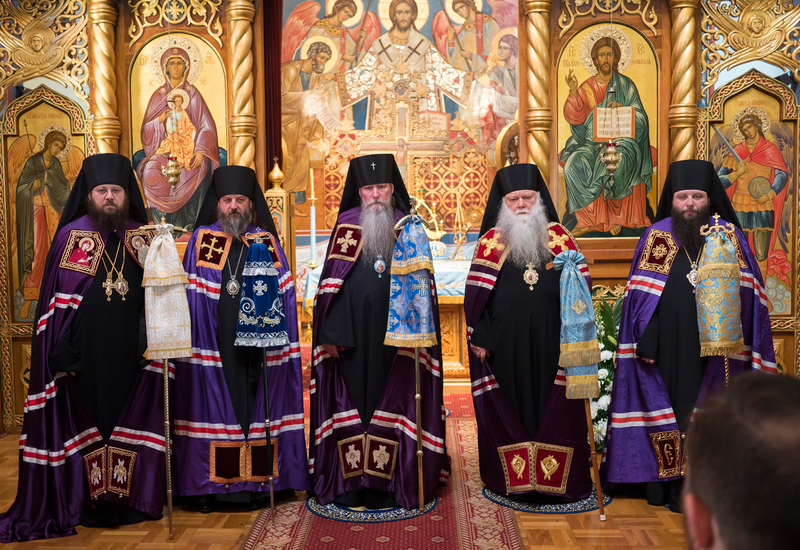 Concelebrating with him were Archbishop Peter of Chicago, Bishop Theodosy of Seattle, Bishop Nicholai of Manhattan and Bishop John of Naro-Fominsk (Moscow Patriarchate), as well as approximately 20 priests and 7 deacons from throughout the Western American Diocese, and other dioceses and jurisdictions. Several parishes around the Bay Area closed for the day so that the clergy and laity would be able to participate in the rare occasion of an episcopal consecration. 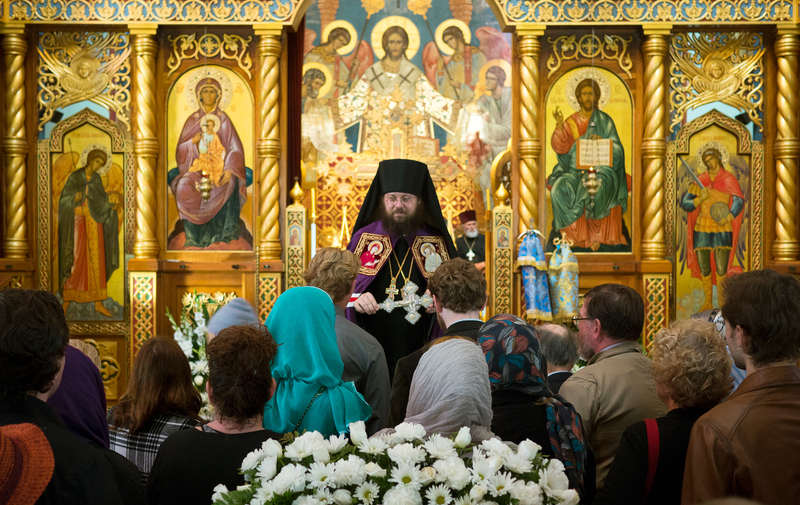 In fact, Holy Virgin Cathedral swelled with the faithful who came to pray with and for our new bishop on that solemn day. 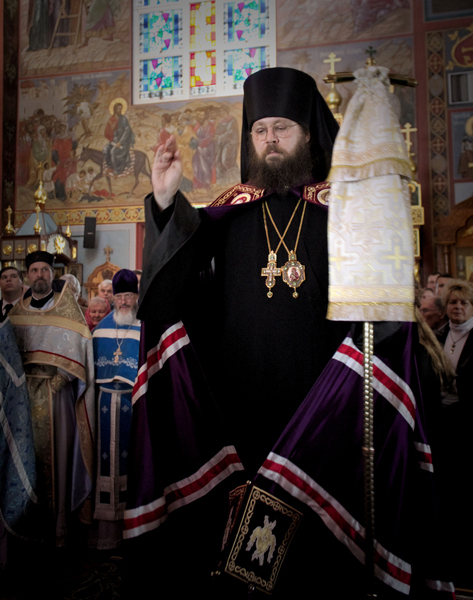 There is a tradition that, when possible, the newly consecrated bishop ordains a deacon during the very same Divine Liturgy, thus becoming the first Sacrament that the former performs. 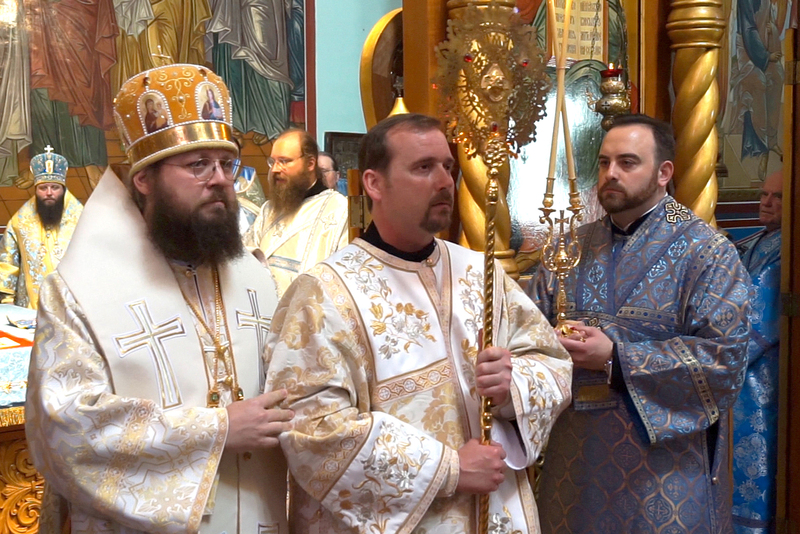 On this day with the blessing of Archbishop Kyrill, Bishop Irenei ordained Sub-deacon Nicholas Stoltz of Holy Ascension Church in Sacramento, CA, to the deaconate, God binding these men as co-laborers in the Vineyard of Christ. The faithful communed from three chalices and then His Grace John of Naro-Fominsk lead the cross procession around the cathedral. Upon conclusion of the Divine Liturgy, His Eminence Archbishop Kyrill uttered a fatherly word of instruction as he handed Bishop Irenei the bishop’s crosier. 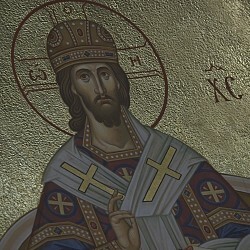 “You are now entrusted with the care to teach, to guide, and to protect spiritually priests, deacons and laity… As a sower who prepares the earth before he plants, you as a bishop need to prepare the heart of man, in order for it to be rich, and so, when receiving this seed, gain spiritual strength…Receive the crosier: a symbol of your episcopal authority; and now that you are a prince of Holy Mother Church, take it, go forth and do the Lord’s bidding.” Upon these words and receiving the shepherd’s staff, His Grace Irenei Bishop of Sacramento ascended the cathedra and bestowed his first archpastoral blessing upon the people of God. 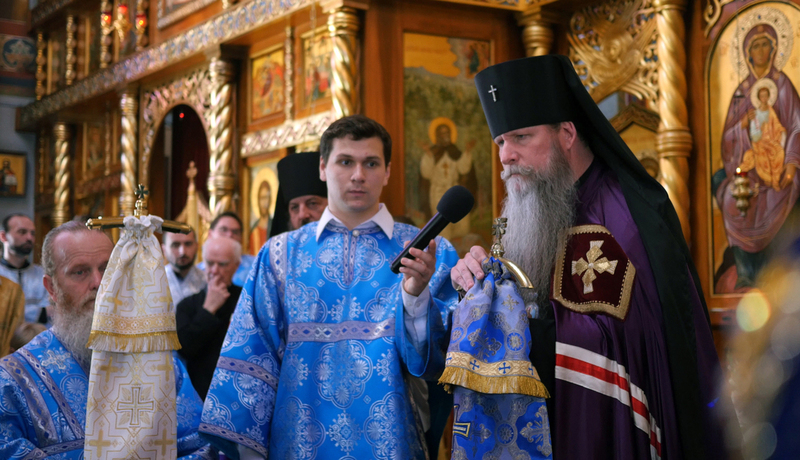 With joy and spiritual peace each of the faithful warmly congratulated Vladyka Irenei as they approached him to kiss the cross. The Sisterhood of Holy Virgin Cathedral prepared a banquet and meal for 580 people. The festal meal stretched across the grounds from the stage hall through to the church school playground where tents, tables, and chairs had been arranged in the yard for the many parishioners and guests. 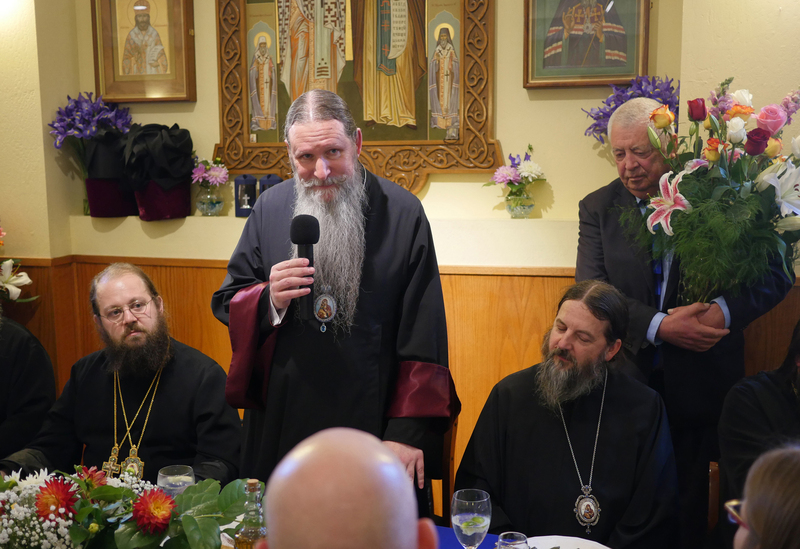 During the festal meal the eminent and right-reverend bishops raised their voices in congratulations to their new brother in the Council of Bishops of the Russian Orthodox Church Outside of Russia. 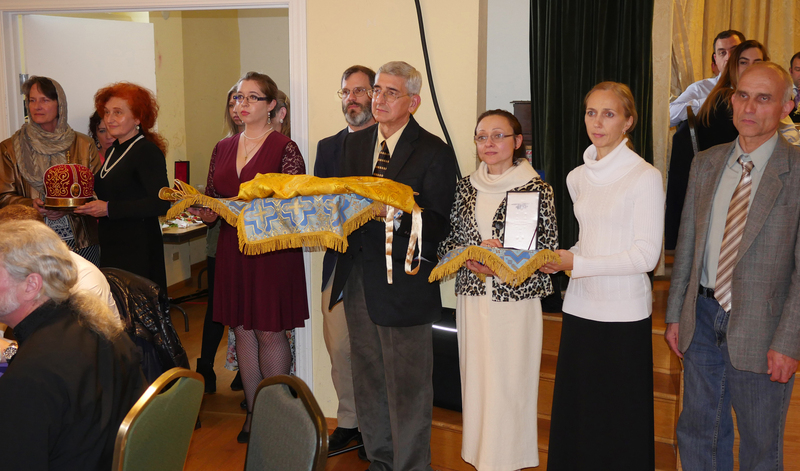 Near the end of the banquet, representatives from the Church Parish Council, Sisterhood, choir and church school of Holy Ascension Church in Sacramento presented gifts of vestments to their new bishop. This day, through the laying on of hands, you have received the Grace of the Holy Episcopacy. You have been summoned to the highest office of Holy Mother Church. You are now entrusted with the care to teach, to guide, and to protect spiritually priests, deacons and laity. Be the embodiment of wisdom, of humility, and obedience to Christ; for of that which you have received—this gift, which is a divine Grace of God—you shall be responsible at the Last Judgment Seat of Christ. As a bishop you are a sower: one who sows seeds that are to fall upon unnurtured soil. The seeds you sow are Christ’s teachings, His words. The earth upon which they fall is the heart of man. As a sower who prepares the earth before he plants, you as a bishop need to prepare the heart of man, in order for it to be rich, and so, when receiving this seed, gain spiritual strength. Seek no counsel of men. Do not trust in man! When one puts dependency on man, one will fall with man; for the help you receive from men, as the Fathers teach, is even weaker than a cobweb. This is the way of the fallen world in which we live. Saint John Chrysostom teaches that when we surround ourselves by learned men of wisdom, then eventually, if we keep what they say, we embody them and become like them. Yet still there is something higher. Through prayer, you stand next to the One Who can give you necessary strength, understanding, support—and that is Christ our God. Envelop yourself in prayer. Stand with God. As Saint Irenaeus, your patron saint, has said: “[The Word of] God became man so that man may become God” (Against Heresies, Book 5, Preface). Receive the crosier: a symbol of your episcopal authority; and now that you are a prince of Holy Mother Church, take it, go forth and do the Lord’s bidding.